As part of the Zoo’s upcoming new “Adventure Africa,” Phase I Elephant Exhibit, elephants Ruth and Brittany have been moved to their new Elephant Care Center. To give them ample time to adjust to their new surroundings, both elephants will be off public exhibit until the official unveiling of the exhibit next May. Since the 1980s, the Milwaukee County Zoo and Zoological Society have partnered to fund a number of projects, resulting in more than $100 million in capital improvements to the Zoo. In 2015, HGA Architects and Engineers (Hammel, Green and Abrahamson), and PJA (PJA Architects & Landscape) were hired for Adventure Africa design. HGA, a Milwaukee-based company, helped create the Zoo’s master plan in 1990, as well as designed the Karen Peck Katz Conservation Education Center, the Temple Monkeys of Tikal Exhibit and the MillerCoors Giraffe Experience. PJA, a Seattle-based company specializing in zoo design, assisted in design of the Florence Mila Borchert Big Cat Country in 2005. Together, the two firms helped meet the Association of Zoos and Aquariums (AZA) standards for elephant care with the Zoo’s new African Elephant Exhibit. 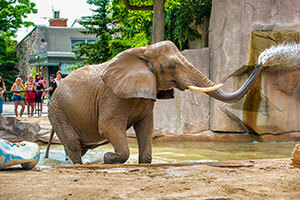 The Zoo is home to two 37-year-old African elephants. Brittany arrived in June 2001 from the Greenville Zoo in South Carolina. She is smaller than Ruth, weighing 7,737 pounds. Despite her size, Brittany is the more dominant elephant. Ruth arrived in December 2006 from the Gladys Porter Zoo in Brownsville, Texas. Ruth weighs 10,397 pounds, and is darker than Brittany and has a more prominent forehead. Ruth and Brittany in their new recreation room. Adventure Africa is the largest physical change to the Milwaukee County Zoo, transforming 25 percent of the current footprint, since officially opening at its present location in 1961. Part of a larger capital campaign spanning the next 10-20 years, the $16.6 million Adventure Africa Phase I project cost is made possible by Milwaukee County and the public-private partnership between the Zoo and the Zoological Society of Milwaukee. Adventure Africa Phase I features an outdoor elephant area spanning 1.6 acres, a 20,000-square-foot Elephant Care Center and two mixed species exhibits which include zebra, bongo, impala and yellow-backed duiker. To remain compliant with the changing standards set forth by AZA, the Elephant Exhibit, Phase 1 of Adventure Africa opens to the public in spring 2019. Adventure Africa gives visitors an up-close experience with the Zoo’s resident African elephants, Ruth and Brittany, in the hope of inspiring them to learn more about the species in the wild and perhaps take action to help conserve their dwindling populations. Research shows that the quality and the similarity to an elephant’s natural habitat is more important than exhibit size. The Zoo adhered to the changing standards put forth by AZA when designing Adventure Africa. The outdoor area of the new Elephant Exhibit is 1.6 acres; 4 times larger than the current indoor and outdoor space combined. Particular emphasis has been placed on the quality and variety of features of the new exhibit for stimulation and continuing enrichment of the lives of the animals. One of the biggest concerns for elephants in human care is their foot and musculoskeletal health. The type of exhibit flooring material is very important for this concern. Adventure Africa floors feature all-natural substrates, including dirt and sand. Adventure Africa continues to offer the elephants ample enrichment opportunities. An 8-foot-deep watering hole, or pool, allows the elephants to display natural behaviors like bathing, swimming and playing. The new barn and outdoor area can accommodate up to five elephants, which allows for a variety of social interactions and groupings. Food enrichment such as feeding walls and push-poles give the elephants opportunities to forage for food. The feeding walls contain holes for the elephants to reach into and extend their trunks. On the keeper side of the wall, different enrichment items and food for the elephants are placed for them to “work” to find. Providing many different items gives the elephants another level of enrichment, encouraging them to problem solve each time they use the wall. The push-poles, also known as wobble trees, are meant to stimulate natural behavior and are also associated with food as a form of enrichment. By pushing on the pole, which is held in the ground by front-end loader tires, the elephants are able to shake food out of the “trees,” again exercising their minds and allowing them to show their natural behaviors.